This Angelic Pope has many qualities similar to that of the Two Witnesses. Like the Two Witnesses, the Angelic Pope is prophesied to restore the faith towards the end of the world. 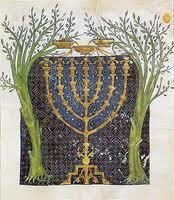 Working together with the Last Emperor or "Second Charlemagne", the Angelic pope is foretold to heal the East-West schism and convert the Jews to Catholicism. If Benedict XVI is to fulfill this role, as is suggested by St Malachy's Prophecy of the Popes, it would require some major developments to occur during his pontificate. Benedict XVI is undoubtedly a Pope devoted to Christian unity, and has repeatedly called for full communion between the East and West (see here and here for example) - asking that the Church should once again "breathe with both lungs". The foundations for full unity between East and West has already been made under the pontificate of Benedict XVI, who is viewed in a more favourable light by the leaders of the Eastern Orthodox Patriarchs. In Ravenna, Italy, in 2007 a joint Catholic-Orthodox commission declared that a basic framework for unification was already agreed, which would begin from the foundation point of both Churches recognising the Pope as titular head (see here) and some form of the authority of the pope would be recognised, and modelled after the role of the pope in the first millennium. Another development which has brought Roman Catholicism closer to Eastern Orthodoxy is the election of Metropolitan Kirill as the patriarch of the Russian Orthodox Church, who is a lot more favourably disposed towards the Vatican than his predecessors. So could the unification of the East and West happen under the pontificate of Benedict XVI? Given the advanced age of the present pope, it would seem unlikely that these developments could advance at such an incredible rate as to occur during his lifetime. 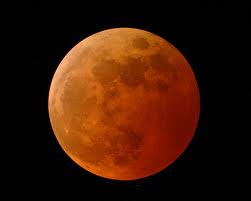 But situations can suddenly change, especially in light of the miraculous, and if a major supernatural event were to occur it could help to hasten this process. Following the announcement of Pope Benedict XVI's resignation on 11th Feb, 2013, it appears that this event could be related to the Worthy Shepherd Prophecy - which predicts that the Angelic Pope would ascend the papacy by "about twelve years shall the millennium have passed". The above prophecy foretells that the Great Apostasy will be reversed through the conversion of England, which then spreads out into the rest of the world. At the moment, the conversion of the United Kingdom to Catholicism seems almost an impossibility. But we can already find that the way is being prepared to allow mass conversions of dissaffected Anglicans to full union with Rome through Pope Benedict XVI's 2009 apostolic constitution Anglicanorum Coetibus. There are major divisions within Anglicanism at the moment, due to capitulation to modern secular values such as the ordination of female and openly homosexual priests and bishops. Many Anglicans are attracted to the stability offered by Catholicism and Anglican ordinarites such as the Personal Ordinariate of Our Lady of Walsingham have already been established, bringing with them hunderds, and potentially thousands of converts. Other Anglican ordinariates are in the process of being established throughout the US and Canada, and these structures may even provide an antidote for other schisms such as those of the Aglipayan Church in the Philippines. This phenomenon has even transcended denominations, and some Anglo-Lutherns in America have requested permission to join with the personal ordinariates being established there (see here). Given the global nature of the Anglican communion, it is not difficult to imagine how the conversion of England could spark a worldwide religious renewal. The Pope himself almost certainly feels that the conversion of England is pre-ordained. He declared that the apostolic constitution was "prophetic" in character, and signed it on Oct 20th - the feast day of St Paul of the Cross, who famously devoted himself to 50 years of prayer for the conversion of England. Other prophecies foretelling the future conversion of England can be found in those of Ven. Bartholomew Holzhauser in his work Interpretatio Apocalypsis: “After desolation has reached its peak in England, peace will be restored and England will return to the Catholic faith with greater fervour than ever before.” St John Vianney also famously stated: "I believe that the Church in England will recover her ancient splendour" (Trochu, F. The Cure of Ars). We have previously noted Cardinal Newman's "Second Spring" sermon, which also envisaged the future conversion of the England. And St. Malachy foretold that Ireland would play an important role in this process: "Ireland... will be instrumental in bringing back the English to the unity of the faith." (See the Catholic Encylcopeadia). England is traditionally known as the "Dowry of Mary" - in a tradition which dates back to Our Lady of Walsingham and St Edward the Confessor. It appears that this "dowry" is a token gift bestowed by the Mother of God to celebrate the coming marriage of the Lamb with his eschatological bride - the Heavenly Jerusalem which is the Church (see Rev 21). It is through the conversion of this nation that the triumph of the Immaculate Heart of Mary promised in the Secrets of Fatima will be effected - and after this, Russia, along with the rest of Eastern Orthodoxy will be reconciled to Rome, and religion will once again flourish before the Second Coming of Our Lord. 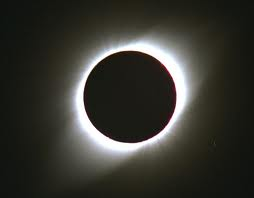 The Latin phrase De labore solis is a common idiom for a solar eclipse, but it also echoes the above passage in the Apocalypse, where the Woman is in the pains of childbirth. Did this motto predict that the prophecy of the Woman adorned with the Sun and the "war in heaven" would take place during the pontificate of this pope? If the prophecy of the Two Witnesses in the Book of Revelation is associated with the martyr-pope or angelic pope of Catholic prophecy, then this motto found in the Prophecy of the Popes could provide a bridging connection which identifies Benedict XVI as the martyr-pope of the Third Secret who helps to establish the Second Pentecost. Following the announcement of Pope Benedict XVI's resignation on 11th Feb, 2013, it appears that this event could be related to the Worthy Shepherd Prophecy - which predicts that the Angelic Pope would ascend the papacy by "about twelve years shall the millennium have passed". If the Worthy Shepherd Prophecy is legitimate, then the motto associated with Benedict XVI - "glory of the olives" could perhaps point to something that would emerge during the lifetime of this particular pope. The choice of motto often points to events which occur in the relevant pontiff's reign. For example, the motto given to Benedict XV (r.1914-1922) was religio depopulata (religion depopulated). This was particularly apt, since this Pope took office at the beginning of World War I, and would see the rise of the militantly atheistic Soviet Union. The motto "glory of the olives" could perhaps mean that Pope Benedict XVI would live to see the "glory of the olives" or one of the Two Witnesses of Rev 11 be elected as pope, and that this would be the Worthy Shepherd/Angelic Pope prophesied by Bl. Tomasuccio de Foligno. If so, then it would seem that the next pope could be identified as the martyr-pope of Catholic prophecy. 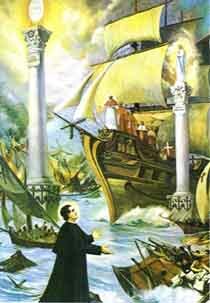 St. John Bosco's dream is remarkable in the fact that it predicted the First and Second Vatican Councils, to such detail as that it even mentions that the First Vatican Council would be interupted (which it was). Note also that a "breeze" comes from the pillars to restore the ship, which is a prophecy of the Second Pentecost - which is intimately related to the ministry of the Two Witnesses. Does this suggest that the two pillars are in fact the Two Witnesses themselves? The Book of Revelation describes the Two Witnesses in language reminiscent of the Old Testament - they call down fire from heaven and work numerous prodigies which recall the miracles of Elijah and Moses. Yet this imagery is almost certainly symbolic. The Two Witnesses are not literal reincarnations of these ancient prophets, or reappearances of their assumed bodies - they will come in their "the spirit and power", just as John the Baptist came in the spirit and power of Elijah (see Luke 1:17). The Apocalypse states that the Witnesses will be martyred as a result of their testimony to Jesus due to the influences of the Antichrist. So just as another two pillars of Christendom (Ss Peter and Paul) met their deaths at the hands of the precursor to the Antichrist (the emperor Nero), these final Witnesses will suffer martyrdom at the behest of the Antichrist. However their deaths will not be in vain, for the Two Witnesses will establish the Second Pentecost, and ensure that the Gospel is preached to all nations. A great king will go up on the throne, and will reign a few years. Religion will re-flourish and spread all over the world, and there will be a great abundance, the world, glad not to be lacking nothing, will fall again in its disorders, will give up God, and will be prone to its criminal passions. One possibility is that the honour of Holy Roman Emperor will be bestowed on a prominent figure amongst the Protestant monarchies of Europe who converts to Catholicism, bringing with them masses of converts. Another less likely possibility is that it refers to an influential politician. 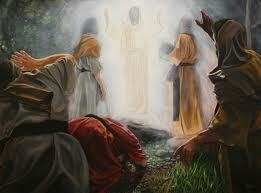 Nonetheless, there are many similarities between these individuals and the Two Witnesses of Scripture. After the two parts which I have already explained, at the left of Our Lady and a little above, we saw an Angel with a flaming sword in his left hand; flashing, it gave out flames that looked as though they would set the world on fire; but they died out in contact with the splendour that Our Lady radiated towards him from her right hand: pointing to the earth with his right hand, the Angel cried out in a loud voice: ‘Penance, Penance, Penance!'. And we saw in an immense light that is God: ‘something similar to how people appear in a mirror when they pass in front of it' a Bishop dressed in White ‘we had the impression that it was the Holy Father'. Other Bishops, Priests, men and women Religious going up a steep mountain, at the top of which there was a big Cross of rough-hewnaspersorium in his hand, in which they gathered up the blood of the Martyrs and with it sprinkled the souls that were making their way to God." 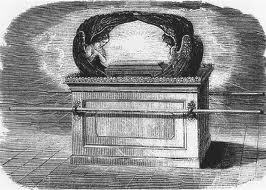 The Mercy Seat of the Ark of the Covenant depicted two angels, and it was here that the blood of sacrifice was offered. Could this martyr-pope of the Third Secret be associated with the Two Witnesses of Rev 11? I confirm to you that, in time for the great Jubilee of the year two thousand, the triumph of my Immaculate Heart, which I foretold to you at Fatima, will come about and it will be brought about with the return with the return of Jesus in glory to establish His Kingdom in the world. 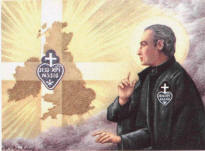 The above prophecy made by Fr Gobbi has been held up by scoffers as a spectacular failure. But it can be rescued if we accept the interpretation I have discussed in previous posts regarding the triumph of Mary - the point when she crushes the Serpent's head and Satan is cast to earth, as was foreseen by Jesus - "I saw Satan fall like lightning from heaven" (Luke 10:18). "I will never forget the night of the 28 September when my family and I stood on a rooftop on the eastern side of the church at 3:30am. It was just before dawn. At 4am a gleam of light appeared on the dome and moved on to the church spire. 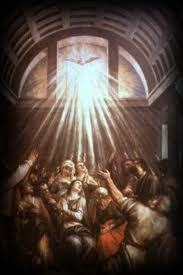 After about 25 minutes, the light began to take on the form of the Virgin Mary holding a square-shaped sparkling object in her right hand. She then appeared in the eastern and western church windows." (You can find the full article here). Was the sparkling box held by Our Lady at Assiut a heavenly tefillin? 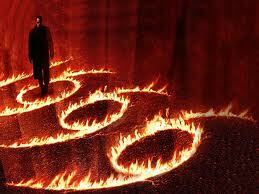 And did this event signify the sealing of the saints in heaven after Satan was cast to earth? (See the full chapter on Mary's role in the "latter times" here). It is striking that St. Louis made this prophecy well before the era of modern Marian apparitions beginning with Rue de Bac in 1830, through to La Salette and Fatima and continuing to the present. The modern apparitions of Our Lady have helped to strengthen and nurture the faith of millions of Catholics worldwide, and as St. Louis foretells, it is through devotion to Our Lady that the head of the Serpent is finally crushed. As I argue in Unveiling the Apocalypse, the defeat of Satan occurs at his expulsion from the heavenly realm, when the ancient Serpent is cast to earth by the archangel Michael - an event which is heralded by a rare sequence of astronomical omens. The Woman adorned with the Sun will be given the wings needed for the "healing of the nations" (Rev 22:2) - the "two olive trees" that stand before the "Lord of the earth" (Rev 11:4). 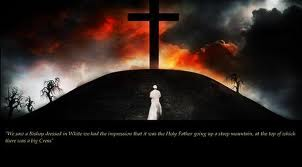 Humanity will be given the chance to repent of its sins before the coming of the Antichrist and the final day of reckoning, so that the Church can dress itself in virginal linen and become the Heavenly Jerusalem before it meets its Bridegroom. 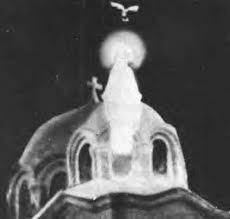 The visions of Our Lady in Egypt that took place between the years 1968-2009 are the undoubtedly the most widely witnessed Marian apparitions in history. 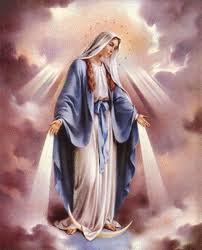 The numbers of those who have witnessed these events are estimated to be in the millions, and unlike the other great Marian apparitions, these visions belong to a category known in Catholic theology as visio sensibilis - i.e. they are an actual physical manifestation. This is distinguished from the common class of visions known as visio imaginativa - where the apparitions are visible only to the seers themselves (like Fatima, Lourdes, etc.). Cardinal Bertone, the former secretary of the Congregation for the Doctrine of the Faith and current Vatican secretary of state, lists the apparitions at Zeitoun as one of the very few modern apparitions officially recognized as authentic by the Catholic Church (See Bertone, T. The Last Secret of Fatima pp10-11). Unlike Fatima and La Salette however, the apparitions in Egypt were not accompanied by a message, and their purpose has been somewhat of an enigma. 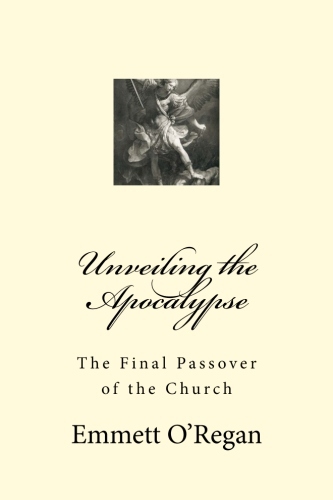 In Unveiling the Apocalypse, I show how these apparitions appear to be connected with the prophecy of the Woman adorned with the Sun in Rev 12, and how the timing and location of the apparitions appear to be the message in itself. There are many paralells between the Marian apparitions in Egypt and the account of the Woman adorned with the Sun in Rev 12. Chapter 12 of the Apocalypse is undoubtedly an apocalyptic retelling of the story of the nativity. The account of the Woman adorned with the Sun tells how she is with child and pursued by the Dragon intent on destroying her offspring, but the Woman escapes into the desert where she finds refuge for 1,260 days or three and a half years. This scene is obvioiusly based on the events of the nativity, where the Holy Family is forced to flee into Egypt in order to escape from King Herod, who seeking to destroy his potential usurper orders the slaugther of the Holy Innocents. The "three and a half years" may then give a date for Jesus' birth in 7BC (which would be in line with the triple conjunction of Jupiter and Saturn hypothesis for the Star of Bethlehem, since this event occurred in that year), and this time period would have ended in 4BC at the death of King Herod. The modern apparitions of Our Lady in Egypt (which are those of Zeitoun from 1968-1971; Shobura from 1986-1991, Assiut from 2000-2001 and Warraq in 2009) have all occurred at places which are traditionally associated with the flight of the Holy Family into Egypt. 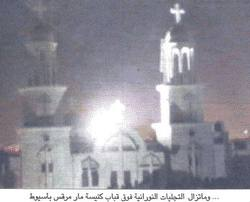 The apparitions took place over Coptic Churches whose names also seem to be of some significance. Those of Zeitoun occurred over a Church dedicated to St Mary herself, whilst those of Assiut took place over St Mark's - and it has been noted that the original apparitions which began in April 1968 coincided with the return of the relics of St Mark (who is the patron saint of Egypt) by Pope Paul VI to Alexandria (see here). Those at Shoubra appeared over a church dedicated to St. Demiana - who in another "slaugther of the innocents" was massacared along with 40 other martyr-virgins during the persecution under Diocletian (see here). Perhaps most tellingly, is the most recent appearances of Our Lady over the church dedicated to the Virgin Mary and Archangel Michael at Warraq in 2009. The only place in Scripture that links the Virgin with the Archangel Michael is in Rev 12. If the apparitions in Egypt are connected with the prophecy of the Woman adorned with the Sun in Rev 12, then it would seem that their timing communicates the most important message in this regard. By combining Rev 12 with the story of the nativity, we know that the Woman adorned with the Sun is forced to flee into the desert because the Dragon, intent on destroying her Child, instigates the slaughter of the Holy Innocents. The event of the slaughter of the innocents was the primary reason for the flight of the Holy Family into Egypt. It appears that a modern "slaughter of the innocents" may also have been the primary cause for this heavenly re-enactment of the flight into Egypt. The apparitions in Zeitoun first began in April 1968 - the exact month when the Abortion Act came into effect in the UK (see here), which paved the way for the legalisation of abortion throughout the world. Did the appearances of Our Lady at Zeitoun herald the arrival of a new "slaughter of the innocents" in the legalisation of abortion?